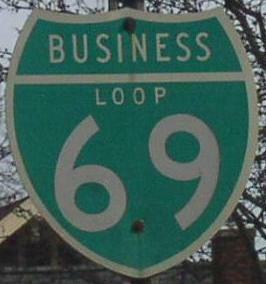 Business Loop Interstate 69 runs east-west across the Lansing Area. The majority of the highway runs along Saginaw Street. 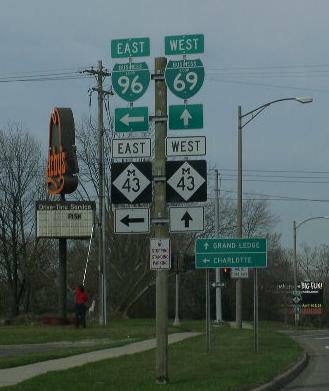 It goes between Exit 93 on Interstate 69/96 and Exit 94 on Interstate 69. BUSN Loop I-69 passes through the following towns in Eaton-Ingham-Clinton Counties. BUSN Loop I-69 is multi-plexed in Eaton-Ingham-Clinton Counties. Michigan State Route 43, from Delta Township to Lansing. BUSN Loop I-69 intersects the following highways in Eaton-Ingham-Clinton Counties. Interstate 69, at Delta Township. Interstate 96, at Delta Township. Michigan State Route 43, at Delta Township. BUSN Loop I-96, at Lansing. U.S. Rt. 127, at Lansing. Michigan State Route 43, at Lansing. Interstate 69, near Meridian Township. 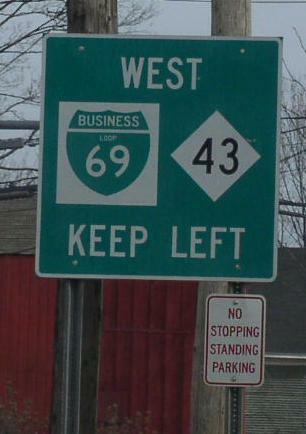 A guild marker on NB BUSN Loop I-96.